Original Story by J.B.E., 1849. Retold by Mark Hamby & Kari Keener. Meet Ema, a good little girl, who obeys her parents happily. One day, Emma's devotion to obey is overcome by selfish desires and she makes one wrong choice. This one sin opens the door to another and before little Emma realizes it, she is hiding one wrong decision after another. As we quickly realize in life, our sin does not just hurt ourselves, but everyone around–especially those we love. What will it take for Emma to confess? 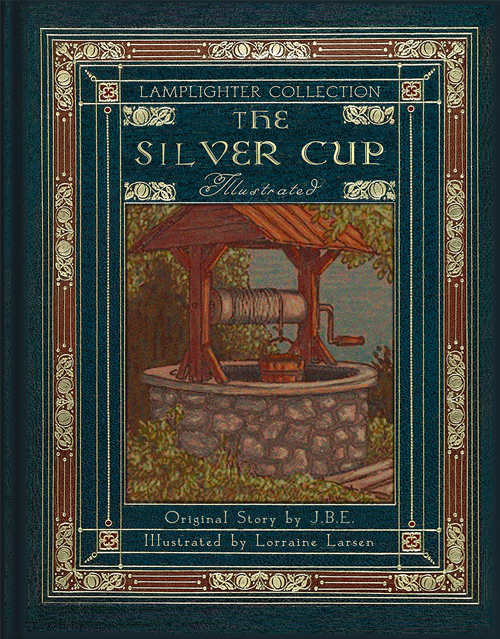 No matter your age, this beautiful story, The Silver Cup, Illustrated, will leave you encouraged to make godly choices, confess your sin quickly, and keep short sin accounts. See what it takes for Emma to learn her lesson and restore the relationships around her. "A cup of sweet water could never spill a drop of bitter water, no matter how heavily it was jolted." From Janet C Dulaney of Marianna, Florida on 1/5/2019 . Gave as a Christmas gift to a granddaughter. A very good picture with words book. From DEBORAH WATKINS of CHICO, California on 12/9/2018 . I read this little tale through before I give it as a Christmas gift to a granddaughter. Sweet, gentle story of having truth on our lips. So happy to know it will be in her library to read and reread. I got this for my 6 yr old daughter. She felt so blessed and loved by receiving such a beautiful & meaningful book. She took to the message right away & has lived it out. I loved how she shared with her 4 yr old brother to always tell the truth because you often hurt the people you love if you lie. It really touched my daughters heart so much that she was able to teach her little brother to do the right thing when he wanted to without info about a broken toy & then praised him for telling the truth. I believe this has prayerfully left a mark on her heart for the beauty of truth forever. Praise the Lord for Lamplighter & these Christian authors. From Deb Schult of Ackley, Iowa on 12/12/2017 . This is a sweet story with a clear message. Young children will identify with the main character and no doubt remember this lesson in honesty she learned the hard way.